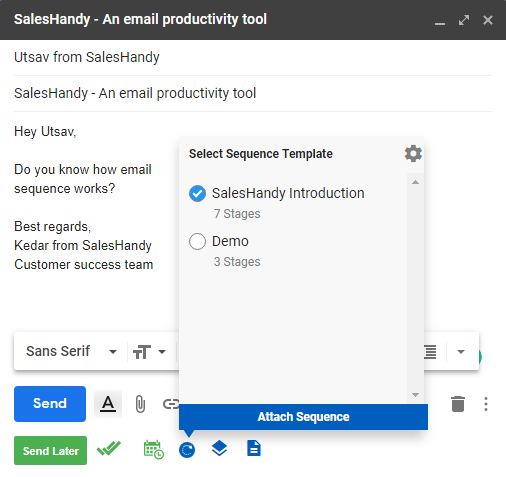 Using SalesHandy&apos;s single email sequence feature you can create customized email sequence for the single recipient. Send any prospect a customized email follow up inside your Gmail with the our Chrome extension. Go to **Email Sequence** page. Click on NEW SEQUENCE to create a new email sequence template. There you can draft up to 10 follow up stages in one email sequence and you can set the specific time and date to send the follow up email at your convenient time. Once you are done with drafting your follow up emails. You need to save that email sequence template by clicking on SAVE SEQUENCE TEMPLATE button. Then go to your Gmail. There create your first email and hit the email sequence button in your compose box and select the relevant email sequence template from the list. Once you are done with selecting the email sequence template, the button will turn Green that means the email sequence templates is attached. Hit the send button to send your first email immediately and your follow up emails will go as per your email sequence. Feel free to reach out to us at support@saleshandy.com in case you need any help.